Home » Interesting Discussions » Your Say: Do you wear or change your makeup according to the seasons? 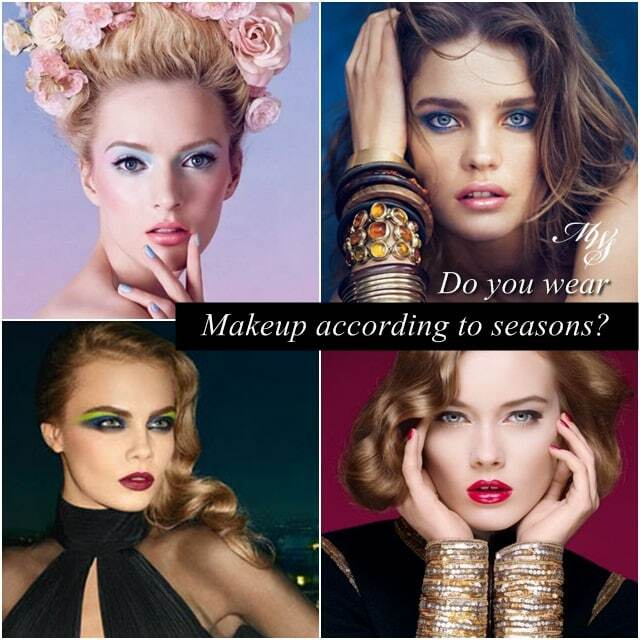 Your Say: Do you wear or change your makeup according to the seasons? I used to be a little more on the ball about the different trend and collection releases that come out every season but this year has been a little up in the air for me. Too many things are happening in real life for me to even bother keeping up with something as ephemeral as makeup trends so I haven’t been paying a lot of attention. However, one thing did strike me as prevalent. When the joy and holiday rush of the December holiday season was over, with its sparkly rendition of makeup, the market was flooded with Spring choices of light colours; pastels for eyes, soft pinks come to the fore for cheeks and lips and pretty, delicate prints and packaging take centre stage. Now that we’re pushing into Summer in most parts of the world, bronzers make their annual appearance together with a deliberate shift to coral and orange shades for lips and cheeks and bolder eye colours – blue is in if you believe Dior. Blue always appears in Spring (baby blues) and Summer (bright blues) but less so in the cooler seasonal collections. It made me wonder if you, as a user, do find that the changing seasons define your makeup colour choices? Or do you feel the need to thanks to the marketing and ad campaigns? When I was living in a country with seasons I wasn’t yet interested in wearing makeup so I can’t speak from experience. Living as I do in a country where the only seasons we get are hot and dry and hot and wet, I can safely say with great certainty, that my makeup choices aren’t influenced by the weather nor the seasons at all. The reason I’m curious about this is because if as consumers, we do find that our makeup choices are in one way or another defined by the seasons, then wouldn’t it be quite a waste of money to be actually buying any Spring or Summer makeup knowing that you’d use it only just for less than half the year before the cold wind and snows arrive again? We seem to be having a lot of long winters in the Northern Hemisphere in recent years. As I said, living where I do, it’s easy for me to wear bright colours all year round. It is just as easy for me to wear light pastels if I’m so minded or soft colours if I’m in the mood. Rich colours do tend to be reserved for the evening but it doesn’t always stop me from bucking that trend. I do tend to wear my makeup according to my mood, occasion and preference, which means I tend to overlook Spring and Summer collections which would logically suit my weather better, and gravitate towards Autumn/Fall-Winter collections which technically have no place in our weather LOL! But as I said, it’s simply because I don’t have definitive seasons here in Malaysia so the weather conditions do not affect my makeup choices. Do you find your makeup choices influenced by the seasons where you live? Do you tend to follow seasonal trends when picking your makeup colours? Yeah, not just makeup, my style changes a lot in the summer for clothes too. But makeup wise, I have some lipsticks, dark plums that I only reserve for the Fall. The brighter lipsticks I use for the spring/summer. I don’t wear foundation anymore, but when I did, I had specific shades lighter ones for winter, and darker ones for summer. Skincare wise, I’m still trying out toners, moisturizers I like, so I haven’t found anything I just use during the summer or winter yet. I’m sure clothes definitely play a part as does the lack of sunlight 🙂 I love dressing up in cooler weather but then, I’m a tourist. I don’t think I’d enjoy it much for everyday if I were to live there! Oh and skincare is a good topic. I’m sure that changes as the seasons change! I think sometimes, with age and certain responsibilities come a need to tone down on colours. At least that’s how I feel LOL Now, all I wear are neutrals in one form or another and my colour makeup don’t get a lot of loving anymore. Pity, I used to love my greens and blues at any time of year! thanks! yes my colors do go further that way. i think it helps to think in color groups too instead of seasonal colors. when you think in colors, what comes to mind is what colors you\’re attracted to that day. when you think what\’s seasonal, you\’re naturally limiting yourself to a certain category of colors unless you consciously decide to step outside the box.